The Jack Ryan 5-Film Collection UHD 4K is a box set that is worth splurging on and if you have a Tom Clancy/Jack Ryan fan in your life I suggest you buy two sets - one for yourself and one to give as a gift. Tom Clancy's first novel, The Hunt For Red October, was sold to Naval Institute Press for $5000 in 1984. The book, which Clancy had hoped would sell 5,000 copies ended up selling almost 10 times as much and was complemented by President Reagan causing it to become a national bestseller. A few years later the second Jack Ryan book – Patriot Games – followed, again to great success. This led to several more novels over the years and ultimately movies deals. For seven years we were entertained by Clancy's stories as interpreted by various screenwriters and directors and finally, twenty-three years later, we were treated to a visual rendition of the early life and backstory of Ryan in Jack Ryan: Shadow Recruit. In anticipation of the new television series Tom Clancy's Jack Ryan Starring John Krasinski (The Office), Paramount Pictures has released the Jack Ryan: 5-film Collection 4K Blu-ray. This box set not only offers all five movies but numerous extras presented in most technologically advanced format. We first met Jack Ryan in theatrical form in 1990's The Hunt for Red October. Alec Baldwin (The Departed) was the first to portray the analyst as he overthought and hypothesized the possible outcomes of Ramius' (Sean Connery; The Rock) actions. Baldwin set a tone of quiet intellect that has permeated the franchise since. Two years later Harrison Ford (Raiders of the Lost Ark) took over the Clancy role and played in the next two films Patriot Games and Clear and Present Danger. The change in personnel seemed to have little effect on the series as Ford was mostly praised for his portrayal. The former film dealt with the IRA the latter took on the Columbian Drug Cartel but both seemed to tap into material from real life as opposed to the make-believe Russian defection in the first movie. Movie four once again saw a change when Ben Affleck took on the lead role. In The Sum of All Fears, Jack Ryan must help locate three missing Soviet scientists and a nuclear bomb. Affleck was handed the role to make Ryan seem younger in order to entice a young demographic however he was criticized for not have the maturity and confidence that Ford displayed in the role. Finally Jack Ryan: Shadow Recruit gave the audience a look at a younger Jack Ryan and the events that led him to the CIA in the first place. As the only film not based on a Clancy novel, it was instead a compilation of facts and tidbits gleaned from the novels and previous films. Starring Chris Pine (Star Trek Beyond) it was touted as more action based than its predecessors and not as well liked. Yet, I feel this is one of Pine's better performances as the audience got a glimpse of a more emotional Ryan while still portraying that inquisitive mindset he was famous for. While the audio and extras are the same as the initial Blu-ray releases the real increase in quality comes obviously on the upgraded video for each release. The vast improvements, of course, are on the first four films in the series. The Hunt For Red October is presented in Dolby Vision UHD with a resolution of 2160p. While the film's transfer doesn't have the "WOW" factor that most modern 4k transfers do, it presents the film in such a way that has not been seen since its theatrical release. Colors are a bit brighter on the already dark palette and areas that were mostly black in the Blu-ray release now come through as varying shades of gray. Jack Ryan has become a symbol of an honest, good guy with intellect. He is a "white-hatted" cowboy and a boy scout in principle. These qualities in a protagonist paired with government intelligence based plotlines have made Jack Ryan – regardless of who plays him – a beloved character on paper and on the big screen. Offering these movies in 4K is a smart move on Paramount Pictures part because while the films are good in general they benefit from this upgrade. This is one box set that is worth splurging on and if you have a Tom Clancy/Jack Ryan fan in your life I suggest you buy two sets - one for yourself and one to give as a gift. 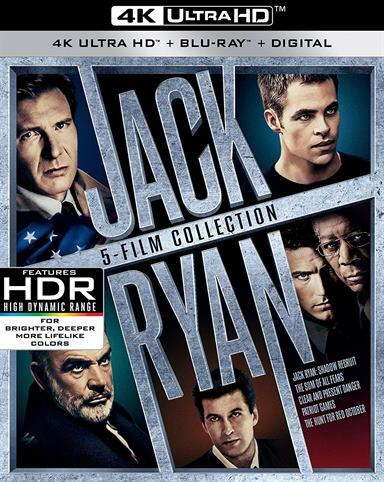 Download Jack Ryan 5-Film Collection UHD 4K from the iTunes Store in Digial HD. For more information about Clear and Present Danger visit the FlickDirect Movie Database.